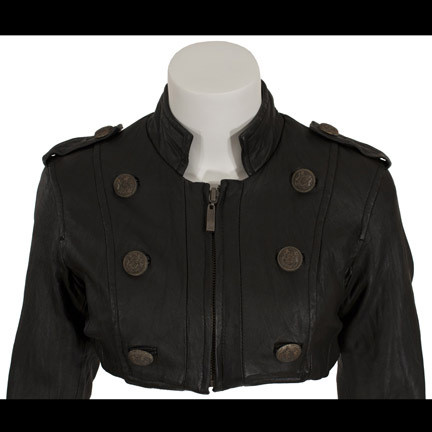 This jacket was worn by the character “Callisto” portrayed by actress Dania Ramirez in the 2006 motion picture “X-Men: The Last Stand”. 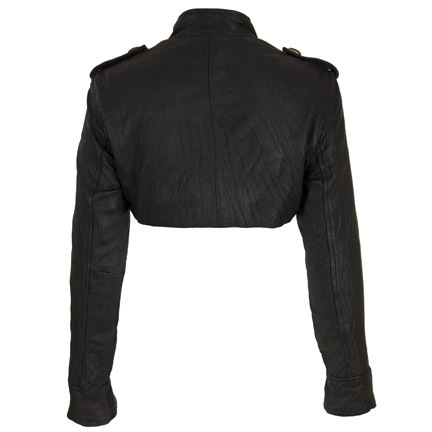 The bolero style jacket is constructed of black leather with zipper front, oversized metallic buttons, and epaulets on the shoulders. 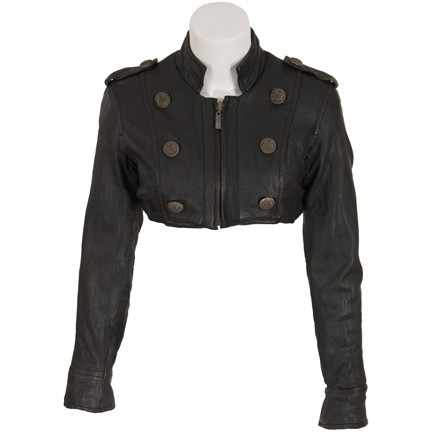 Ms. Ramirez wore this signature garment in multiple scenes throughout the film. She first appears wearing the jacket in the hideout of "Magneto" (Ian McKellen) when she informs him that she’s detected a Class 5 Mutant more powerful than he is. Magneto asks “Where is she?” indicating that he already knows she’s referring to "Jean Grey" (played by Famke Janssen). She next appears wearing the jacket in a scene in the woods at the evil mutant camp when Callisto expresses concern about Jean Gray’s stability, and tells Magneto “She shouldn’t be here”. 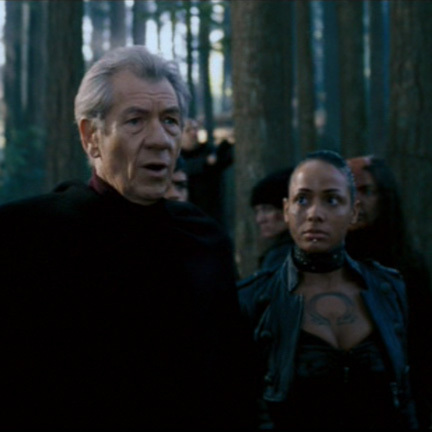 She also appears in a later scene in the woods when Callisto and a group of other evil mutants stand behind Magneto as he gives a rousing speech to his army. 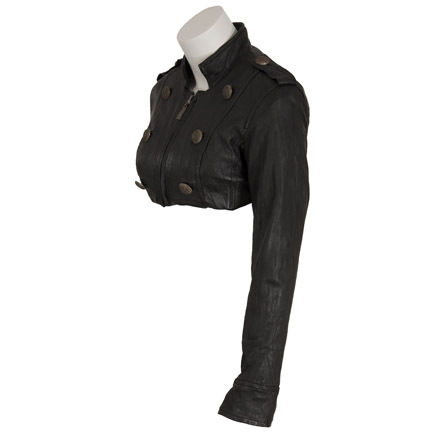 Also worn in a scene on a cliff top in San Francisco with Magneto and other evil mutants when she confirms that the boy mutant who cancels out powers is on Alcatraz Island, and then in the following sequence when the mutant army walks across Golden Gate Bridge before Magneto levitates it. She appears again in the climactic ending of the film during the Alcatraz battle sequence when she faces off against "Storm" (Halle Berry) and loses after being electrocuted on chain link fence by Storm’s lighting bolts. 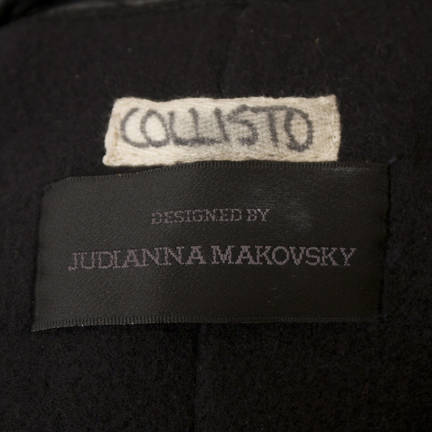 The jacket was custom tailored for the actress and is complete with the original costume designer’s label “Designed by Judianna Makovsky” sewn inside and an additional label with the character name “Collisto” (sic) handwritten in black ink. Judianna Makovsky recieved a “Best Costume” award from The Academy of Science Fiction, Fantasy, and Horror Films as well as a Costume Designer’s Guild Award for “Excellence in Costume Design for Film – Fantasy” for her outstanding work on the film. The garment is in excellent condition with some minor oxidation on the buttons and is accompanied by a letter of authenticity from the costume house.